Beloved and I celebrated our fifth anniversary at Seryna. This Japanese restaurant is one of the few gastronomic places located at Little Tokyo. This one is at the outer periphery, and can be accessed without going to the communal alfresco area. According to fellow foodies, this place has the best sashimi in town. Excited, we opted for a reservation since we heard this place always gets full. Luckily, we were able to get one. I’ve noticed that most of the places in Little Tokyo specializes in one particular Japanese specialty. 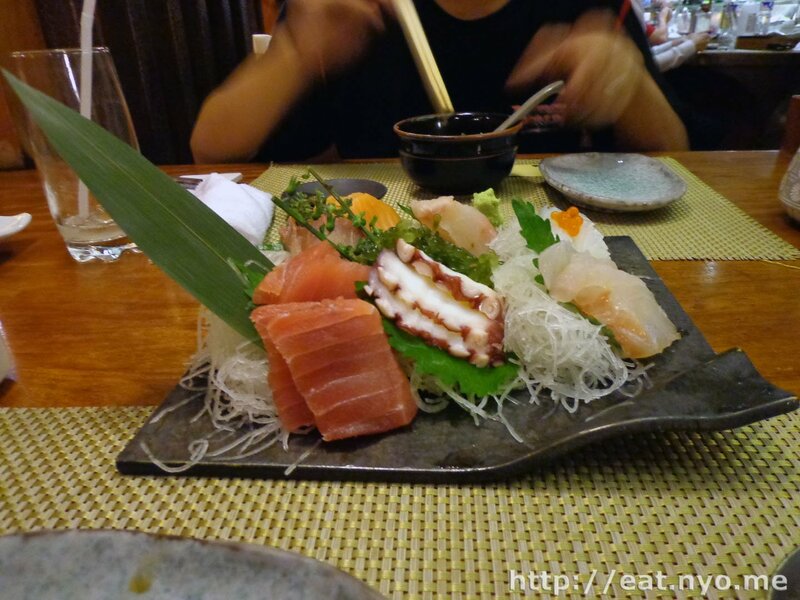 However, most places have common dishes, specifically sushi and sashimi, among other Japanese favorites. Beloved got there first, and it took me a while to get there. During her impatience, she ordered for herself their Matcha Shaved Ice (135 Php). When I got there, we finally got to look at their menu, which isn’t actually very different from the usual Japanese restaurants, if not for the unusual varieties of the usual stuff. For example, there were sushi and sashimi choices that I’ve seen for the first time, and there were yakitori or skewered grilled choices that, although I’ve heard of, seemed like only this place carries. 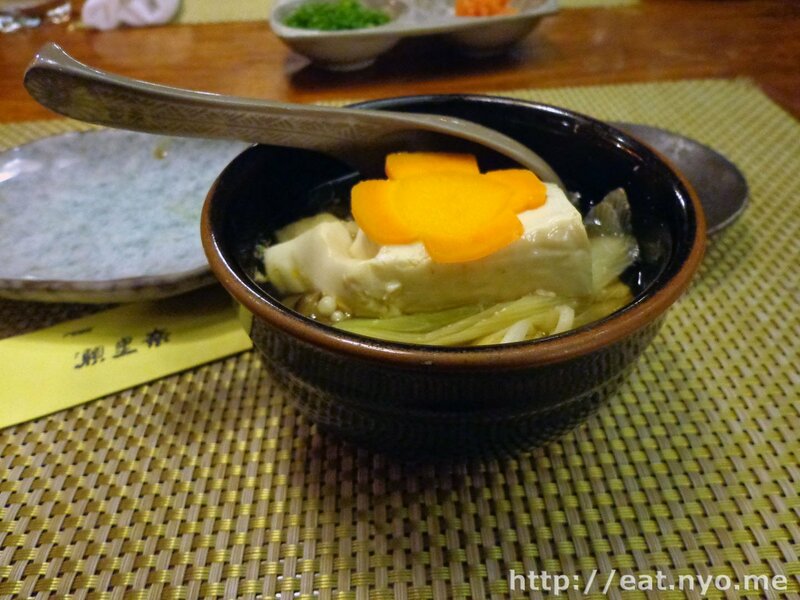 They also have nabemono or hot pot among the usual tempura and donburi or rice meals. Both Beloved and I aren’t really big on sushi, since it has rice. So we opted for the latter specialty. We got their Nanaten Moriawase Sashimi (860 Php), literally seven various sashimi. We also got their Yose Nabe (1100 Php), which was good for two because it was one of the more unique choices here. 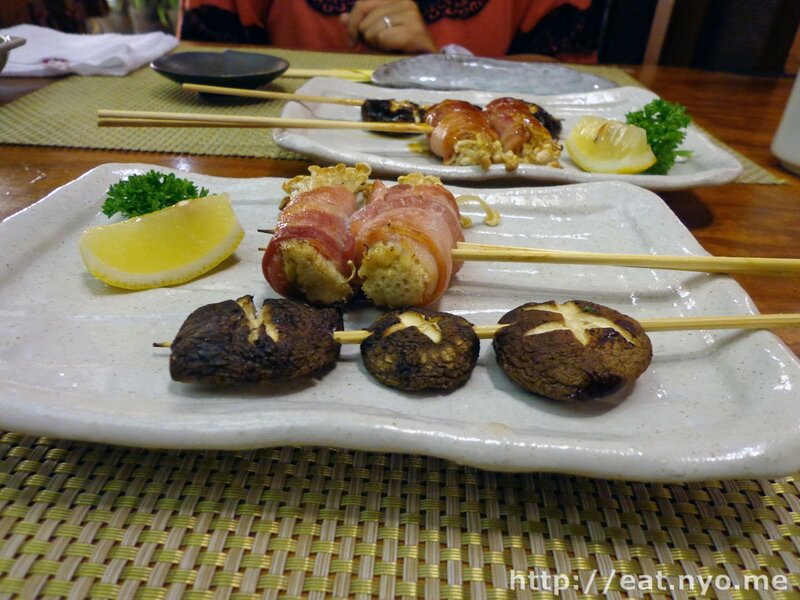 Finally, we also ordered a couple of each their Shiitake Yakitori (50 Php each) and Bacon Enoki Yakitori (70 Php each). Their yakitori can have either teriyaki sauce or salt. We opted for one of each. The yakitori arrived first. Above is their Shiitake Yakitori and Bacon Enoki Yakitori, separated in salted and teriyaki. It’s pretty easy to figure out which is which (hint: one is dry, the other isn’t). I enjoyed these a lot. They weren’t really grilled very long, just enough to give them a hint of smokiness. The meaty shiitake, I believe Beloved preferred. I loved the bacon enoki. The bacon was chewy and the strands of enoki shrooms gave it a stringy-meaty texture. Both salted and teriyaki versions turned out the same. One was, of course, a bit sweeter and the other a bit saltier. I’ll let you figure out which is which. 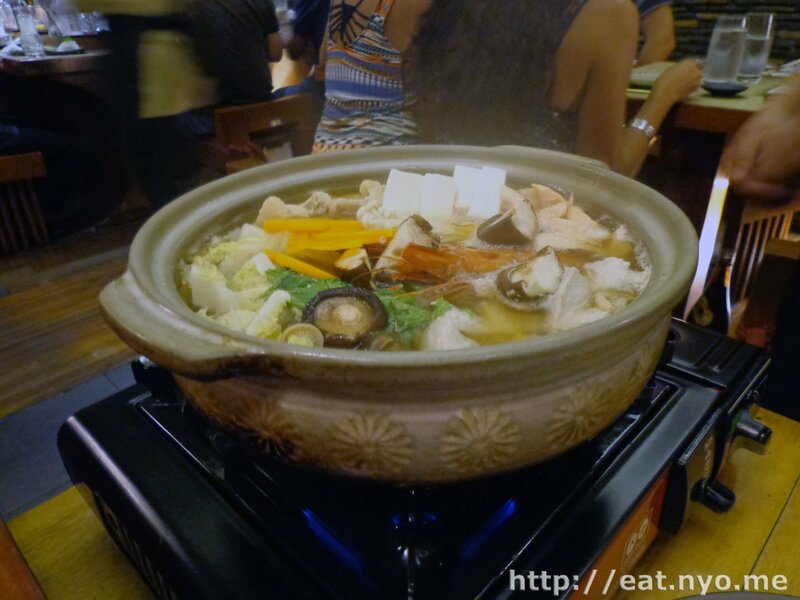 I should mention that our server recommended we get the for-one version of their Yose Nabe. Beloved frowned upon the idea, so we got the one good for two to three, explaining the price. We thought we would regret the decision when the huge clay pot filled with stuff arrived next to our table. And when I say “filled with stuff”, it literally was filled with stuff. It had lots of mushrooms of different varieties, cabbage, leeks, carrots, tofu, and meat from prawns, salmon, tuna, and chicken. It was cooked right beside our table in a soy-miso broth. The server meticulously ensured that both Beloved and I get equal portions to our serving bowls, which impressed me a lot. As meticulous as our server divided our huge pot, she also was attentive enough to refill our bowls when it emptied, even though it was a visibly busy night and she had other tables to attend to. I’m emphasizing this fact because I rarely get such excellent service from any other restaurant. As for the food, it was down-to-earth delicious. The soothing, hot broth made most of the veggies soft and cooked all the meat enough to enjoy. I enjoyed the amount and freshness of fish they added here, and I think they even put in some belly parts, which I like a lot. Oh, and it had glass noodles, thicker than what we were used to, which was a good thing since we didn’t order any rice. The reason we went here, their Nanaten Moriawase Sashimi, gave us a beautifully-crafted plate of seven kinds of sashimi. I honestly don’t know three of them exactly. What I could tell were the usuals: tuna and salmon, and the not-so-uncommon: octopus and squid. Among the three unknowns, they were mostly white flesh. One had a red accent, which I’m guessing was the belly part of some fish. They had varying textures, from the gummy octopus to the very slimy squid to the soft tuna and the butter-like salmon. The white-flesh ones had a bit tougher texture, but they were still soft and fresh. In fact, all was very noticeably fresh, which affirms most gastronomers claim. In the end, we enjoyed the salmon the most, and I’m certainly ordering a plate of this alone next time. I didn’t get to try the** Matcha Shaved Ice** in its original form. 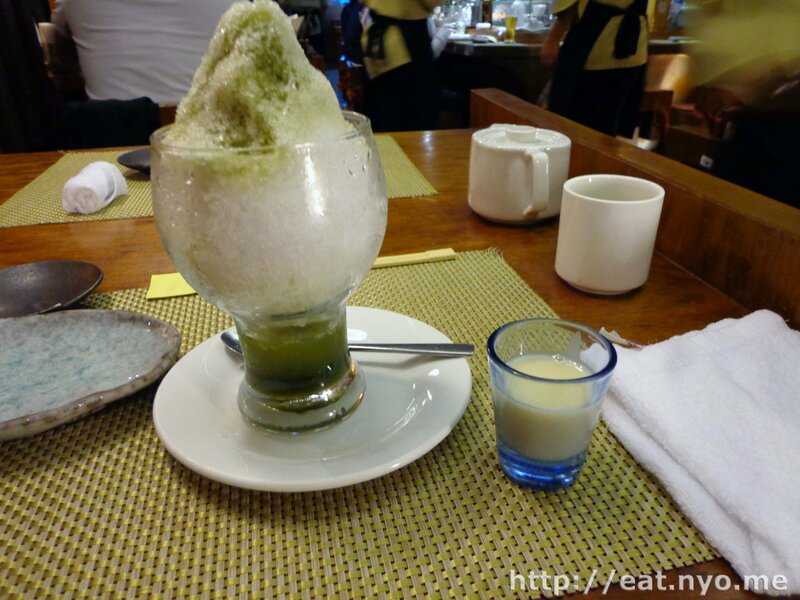 It was served with a shot of condensed milk which you optionally add to the heaping amount of shaved ice. Beloved felt she didn’t need it, as it had a genuine powdered green tea taste. I did get to taste it in liquid form, which was a bit on the sweet side but was good nonetheless. I’m still unsure if this place really serves the best sushi and sashimi. However, I did notice that the place was packed full and had a lot of Japanese as their patrons, ordering strange varieties of sashimi and sushi I’ve never seen before. Maybe the real magic is there, but it seemed like we already experienced some of it. Ironically, I felt it more with their Yose Nabe, especially with the way the server scrupulously handled it. I want to come back here and try out their sushi and more of their sashimi, but it’s admittedly a very expensive date, costing us 2.5K after service charge. I still felt it was well worth it, so after trying out the other places of Little Tokyo, I’ll make sure to return to Seryna. Recommended for: Fresh fish lovers. Not recommended for: Poor, Japanese food haters. Smart nomnomnom tip: Reserve, especially during weekends: call (+632) 894-3855.